As part of the Legal Advice Centre's Pro Bono Team, I would go to a local community centre and give legal advice. 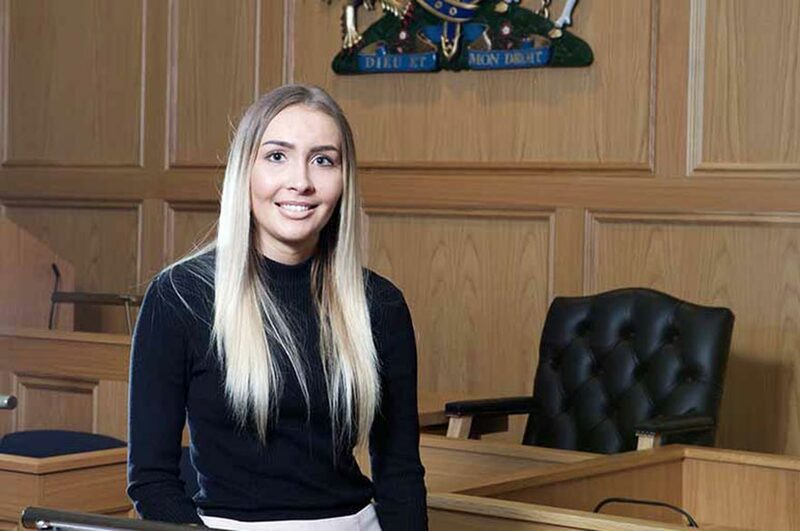 "I studied Law and Psychology as part of my A-levels, so the opportunity to merge Law with Criminology was an important factor for me because I wasn't sure about which career route to take. As my course is a qualifying law degree it gives me the flexibility of exploring my options whilst still being able to go on to qualify as a solicitor if desired. Mooting is part of the Criminal Law assessment, which seemed daunting at first, but it has really improved my communication skills and confidence which are both good points to have on my CV. "As Vice President of the LEX society I have organised events, managed the society's social media and email accounts and liaised with legal professionals to help enhance the LEX students' employability, and whilst doing so I've made useful connections within the legal world. Also, being involved with the society had vastly improved my organisation and communication skills as I have had to balance my roles alongside my university work and other part-time roles. "Last year, as the Legal Practitioner Officer Assistant of the LEX society, I participated in arranging the annual networking and dining event for students and local professionals. It took a lot of time and dedication to set this up and there was a lot of pressure with it being one of the largest events for our society. All of our hard work eventually paid off and the night was a huge success with some professionals stating it was the best society event they had ever been to. "During my first year I took part in legal skills workshops that made me aware of how to interview clients and effectively take notes during client meetings. We were assessed on our interviewing techniques which consequently led to an interview to become involved with the Legal Advice Centre. "As part of the Legal Advice Centre's Pro Bono team I would go to a local community centre and give legal advice to those who couldn't afford legal fees. Issues ranged from family law to employment law, and it was a great opportunity to get first-hand experience of giving advice to clients in a legal setting. Tasks included interviewing, researching and drafting letters of advice to clients which were all supervised by one of the senior lecturers at the law school. "Additionally I have volunteered for Age UK as a Volunteer Advocate which involved me visiting clients and helping them with administrative tasks such as pension queries or paying bills. This involved a lot of responsibility as I had my own clients to advise, and had to ensure I completed the relevant paperwork accurately and notified my manager if I thought any further assistance was needed. "I am going to work abroad over summer after graduating, and then hopefully get a job within the legal sector. I am currently applying for training contracts and business graduate schemes to commence later this year. I have come to realise that there are many careers open to me as a law graduate, so I am keeping my options open!"